Bumping into a family friend at the grocery store the other day reminded me of something important. There are countless people across the country whose suffering goes almost completely unnoticed. And it’s quite possible you’re one of them. Every day there are people who are diagnosed with chronic conditions: Alzheimer’s, cancer, diabetes…and the list goes on. These conditions slowly cause the body to degenerate and make life increasingly more challenging for those diagnosed with the disease or condition. And although we all know these diseases are damaging for the people suffering from them, the impact on the spouses, partners, and loved ones is rarely recognized. You see, my family friend, Elizabeth, has been married to her husband for 36 years. When I bumped into her in the frozen section at the grocery store last weekend, she told me that he was diagnosed a few months ago with Alzheimer’s disease…a nightmare come true for Elizabeth. Right now, her husband is only in the early stages, but she’s quite unsure of how she’ll be able to handle things as the disease inevitably progresses. So I gave her some heartfelt advice, which I’ll also share with you in case you’re going through the same thing as Elizabeth, whether it’s with a loved one with Alzheimer’s or any other chronic condition. When someone you love, like a husband or wife, is diagnosed with a chronic condition like Alzheimer’s, the fact is that your life changes just as much as theirs does. In fact, at times, it might be even more difficult for you. 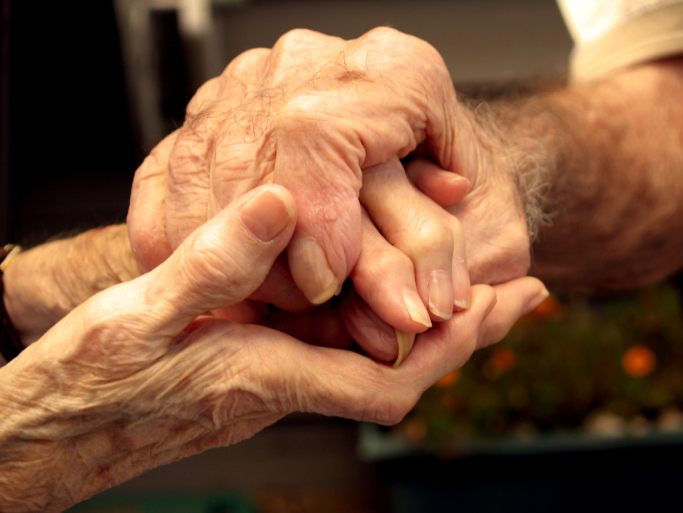 Your role in life has gone from being a spouse and partner to a caregiver. What’s even harder is that the person you love might not even recognize you anymore. All the years you’ve shared together and memories you have are lost, and the future you had planned together is gone. Such news is not easy to take, and it can create a wide range of emotions. As I told Elizabeth, the important thing to remember is to recognize and rid yourself of any resentment you may feel toward your loved one. Your relationship has changed and will never be the same, but no one is to blame for this. Coping might be difficult, but continue to love the person and do your best to move forward. Becoming a caregiver is never easy, and there are millions of Americans each year who are learning to do it on the fly. As Elizabeth and I discussed, you may be required to provide constant attention to your loved one—bathing them, dressing them, feeding them, and helping them get around; other times, you may only need to make sure they’re taking their medication regularly and their nutrition is on the right path. Whatever your tasks are, try to stay positive. Remember the commitments you made to this person and who they are. Recall all that you’ve been through and how much they need and appreciate you, even if they aren’t aware of it. This next bit of advice was hardest for Elizabeth to accept, as she was taught that it was most important to be strong; never to show weakness. However, I say that it’s okay to take some time to cope. Your world has just turned upside-down. You’ve just been told that your life partner isn’t going to be around (figuratively or literally), and you deserve some time to wrap your head around it. You also need to learn to be a caregiver and you may be required to take this on full-time. Be sure to get help when you need it and take some time to yourself every now and then to see family and friends or just relax and recharge. Don’t allow yourself to feel guilty for taking this time, like Elizabeth does; you not only deserve it, but you need it to be sure you stay both physically and mentally healthy. These will be trying times, but there is help available. Talk to friends and family about offering some assistance and be open about how you’re feeling. There are also support groups available for spouse caregivers that I’d encourage you to look into. Overall, remember that you’re not alone in this.